The course is spanned over a duration of two months and the student ratio of the classes is 1:6. BENGALURU : Golf is no more a sport that remains restricted to the ‘elite’ adults. With new-emerging golf schools and programmes that are geared towards training children, many have started taking up the sport seriously. There have also been cases where children have migrated to the state for the sport.Vice Chairman of the AV Thomas group of companies, Dilip Thomas, who was present at India Golf Expo 2018, says he has been practising the sport for the past 20 years. The Touché Golf School situated at Jhakur Post in Yelahanka, provides for summer coaching for children aged between five and seventeen years. The course is spanned over a duration of two months and the student ratio of the classes is 1:6. The cost of teaching amateur golfers starts from `15,000. Each of these courses are specially designed to enable children to grow and develop an interest towards the sport. The TSG Academy’s Bangalore junior programme at Zion Hills Golf country, provides a platform for all juniors to test their skills against the best in their respective age categories. 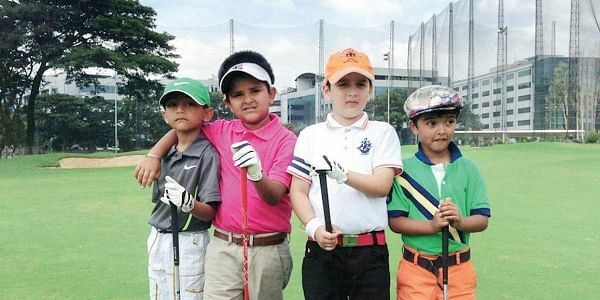 Owner of the Academy, Tarun Desai, has taken up an initiative to train children who do not belong to families of golfers. He aims at imparting a holistic education which goes beyond the singular learning of the sport. One of the spokespersons of the academy says, “We have players from every section of the society enrolling at our academy. They are eligible as long as they clear the required benchmark and are able to pay the fees. These days, the opportunity bar has been widened and many children want to pursue golf as their career.” Rahul Ganapathy, the director and head of instructor at the clover greens golf academy, is also known as one of the finest professional golfers of Southern India. He has coached at the Karnataka Golf Association in Bengaluru, which hosts many junior gold courses across the city. He is known for providing training to all children (both members and guests) between the ages of five and seventeen. The coaching is carried out for eight hours in a month, which is usually taken on weekends. The training here is imparted on several areas of the sport, such as the long game, speciality shots, recovery shots, skill challenges and mental aspcets of the game. Along with Golf skills, these children also benefit from a fitness programme with assistance from the gym instructors of KGA. One could not ignore the effect of GST on equipments, and the pressure it has on the manufacturing industry for sports. The tax levied on these equipments ranges from 12 per cent to 28 per cent. This hike has also irked the sports authorities who believe that sports equipments should be made cheap for it to be accessible to everyone. On asking Dilip Thomas, on how far the government supports the golfing industry, he says “there is a massive need for support from the Karnataka government in order to acknowledge this sport and make it more feasible for the middle class people.